Dimensions (HxWxD): 7" x 7" x 11.5"
This beauty is a large natural, unpolished, extremely clear and color saturated 7 inch long, 11 inch high Golden Healer Lemurian Channeling Cluster, weighing nearly 10.5 pounds, which comes from one of the new Lemurian mines in the Serra do Cabral mountain range in Brazil. The Golden Healer Lemurians are a relatively new find. Our source in Brazil for the finest Lemurian crystals first made these available to us in July 2010, and they did not reach the broader mineral market until the Denver show in September 2010. 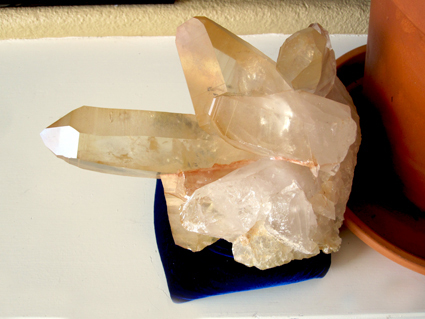 Since 2010 this beauty has been on one of the altars at Satya Center, in Curtis and Jane's private collection but the time has come for this crystal ally to go to a new home. Read more about the mineralogical and metaphysical properties of Lemurian crystals of various types in our new online book "Spirits of Stone". Read Chapter Two & learn about the history & use of Lemurian Seed Crystals. See new photos from the Lemurian mines of the Serra do Cabral and a map of the mines. You'll find links to this new book, in the left hand column of this page. Just scroll down and click to enjoy! 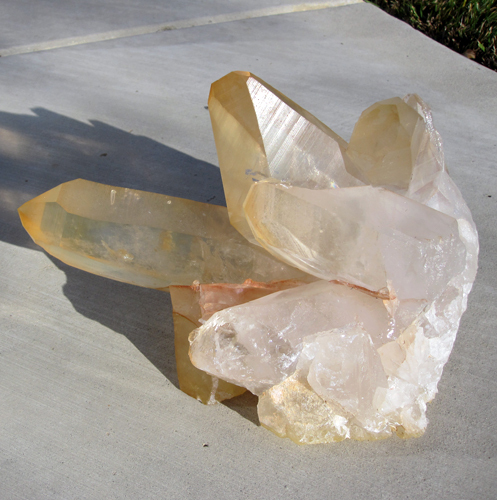 The largest, longest point protruding from this beautiful Golden Healer Lemurian crystal cluster is a powerful channeling wand which contains the distinctive seven sided face opposite a triangular face that marks a channeler. 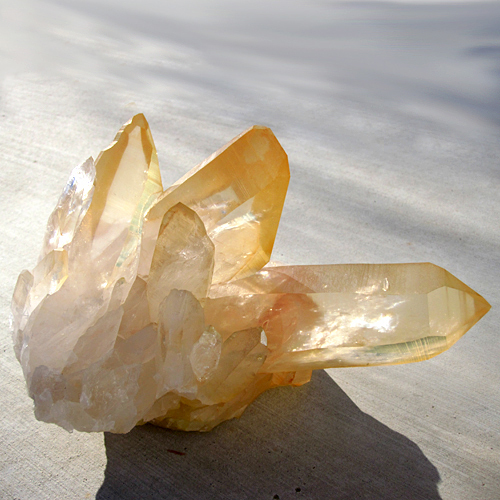 This channeling crystal gives the entire cluster a unique ability to connect the user to inner spiritual guidance, and to sources of Higher Wisdom in spiritual worlds, such as Spirit Guides, Angelic Presences and Spiritual Teachers. 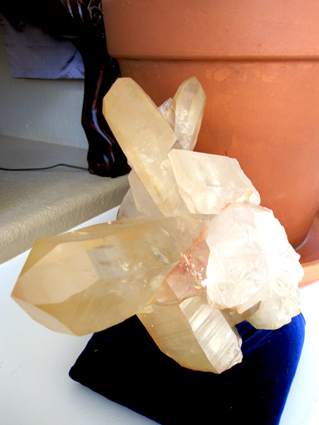 This Golden Healer Lemurian crystal cluster displays remarkable clarity throughout. Hematite or iron oxide inclusions give this Golden Healer Lemurian a distinctive golden orange color. The golden-orange coloration, and the infusion of hematite gives this Lemurian cluster a distinct metaphysical connection to Archangel Michael, as is explained in the paragraphs below. The pain and suffering humanity is experiencing results from a totally imbalanced cultural relationship to nature, to spirit and to soul-life, especially to the divinities and Ascended Master Teachers and Guides. This imbalance in the group consciousness of humanity impacts all human beings, no matter how advanced they may be spiritually. The meteoric sword of Michael was thought to cleanse the Earth’s atmosphere of summer's sulfurous influences, allowing the Higher Self to emerge and guide the initiate along the path of Spirit toward the birth of the Inner Christ Light, an event which takes place in December, during the festival of Christmas.? 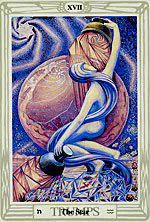 ?For more information on Michaelmas, see "Libra Festivals: Michaelmas, Rosh Hoshanah, Ramadan and Navratri". Hematite "assists in the dissolution of negativity, transforming the negativity, in the dissolved state, to the purity of the universal light of love," according to Melody. "It can be used to stimulate the desire for, and to facilitate the attainment of, peace, self-control and inner happiness"? ?This crystal has been cleaned with Universal Life Force Energy, and given an energy attunement using , a Japanese technique of energy healing, so it will continue to receive and transmit Universal Life Force Energy direct from the Source of Creation. It has also cleaned and charged with the natural energy of sunlight. It is ready for you to program according to your own needs and desires. 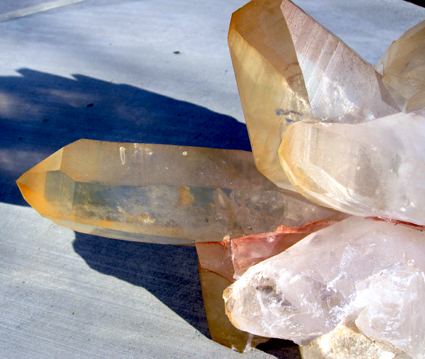 Check out the article Using Quartz Crystals in Digital Technology, Healing and Meditationfor an overview of the metaphysical and mineralogical properties of quartz, and a step-by-step guide explaining how to cleanse, charge, and program quartz crystals for healing, meditation and other spiritual purposes. Note: weight above is shipping weight. Net weight is 167 oz. or 10.43 lbs.